There has now, officially, been a Cars related moved released for each of my kids. I am pretty sure that is what Disney was aiming for – to make my life easier. The latest instalment, Cars 3, comes just as E4 is gaining a real interest in vehicles and racing and all sorts of noisy things. Scratch that. The noisy part has always been there. In each of the Cars movie, we see Lightning McQueen at a different point in his career. At first, the hot shot rookie has much to learn about patience and the wisdom of his elders. Then, he learn the value of true friendship while travelling the world. In this third instalment, we see him grow into a caring and giving persona, willing to put someone else ahead of himself. Taken as a whole, the Cars movies are pretty ingenious. We loved that these movies were not the same storyline over and over again. Each time, there is a different character trait brought to light and improved. And while the cast remains the same, the ‘extras’ that are brought in keep things fresh and interesting. Using the Rafflecopter form below, my Canadian readers can enter to win a copy of Disney/Pixar’s Cars 3. Odds of winning will depend on the number of eligible entries received. Not responsible for lost or misdirected entries. Contest closes December 4, 2017 11:59 pm ET. Good luck everybody! 52 Responses to "Cars 3 DVD: Review & Giveaway"
I have not yet seen Cars 3, but I'd love to watch it with my grandson! We've seen Cars 1 & 2 only....looking forward to seeing Cars 3. I have watched them all. It's one of my favorite Disney series. Yes, I have watched every single Cars movie with my two little boys. 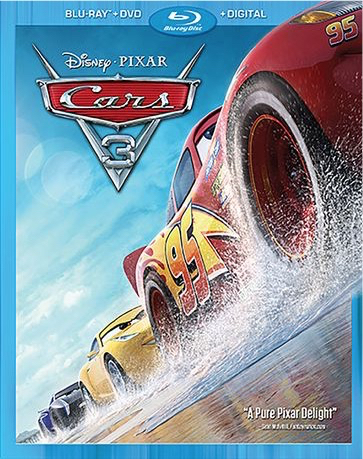 It would be great to win the Disney/Pixar Cars 3 Blu-ray/DVD Combo Pack. In response to your question of Have you watched all of the Cars movies? No i haven't. Thank You for having this contest. WE have watched all 3 and this third one is very good. i have only seen the first two movies! Not yet! The little one's more into Elsa and Anna at the moment, but eventually we'll watch them! Yes, I have seen all the Cars movies ... they are all great! No, we haven't watched all the car movies, though we hope to in the future. We have not seen it yet but are big Cars fans! I haven't seen the latest yet but my kids and I own Cars 1 and 2. We love them. No I haven't, however I'm sure that my grandkids have and they loved them. We have watched them all and they are my son and my favourite movies. We watch 1 and 2 all the time and would love to win this DVD so we can add that it to our weekly family movie nights. I've watched the first Cars. This family has watched all the Cars movies but havn't gotten the DVD to watch at home yet. So far I have only seen the first 2 Cars movies. I have watched the 1st and 2nd Cars movies and Planes but I haven’t seen the 3rd yet. I have not watched all the Cars movies.Only the first one with my grandson. Yes! My kids LOVE them! I have seen 1 & 2 but not 3. I have seen the first one but have some catching up to do! No, I haven't watched any of them. I would love to win this for my great nephew, though, who just loves them! I have yet to watch Cars 3 but have watched the first two countless times. We have seen the first one many times, the second one once, and haven't yet seen Cars 3. We haven’t seen every Cars movie. Only the 3rd and my 3 year old loves it! We have! Once the 3rd one came out on Demand we rented it for 2 days and my kids LOVED it!! I haven't yet watched all the Cars movies, only the first one, which we loved. O yes !! My son loves Cars :) He watches the others all the time !! We have watched all Cars, Planes and Turbo!